Hiring a taxi at the airport facilities is recommended only for emergencies, since their rates are very high. Taxi cabs are found outside the exit gates of Terminals 2 & 3 at the Cancun Airport. To use the Taxi service you need to buy their tickets at their booths inside the terminals. You must know that taxi prices for a last-minute purchase at the Cancun Airport can be at least five times higher than pre-arranged ground transportation services. All taxi rates are based per trip, not per person. Most of the taxi cabs have a capacity of 4 people and some vehicles are only for three passengers. Cabs are available from 7:00 a.m. to 11:30 pm in Terminal 2, and outside Terminal 3 they're available 24-hr. Credit card is not an option to buy taxi tickets, since taxi cabs at the Cancun Airport take only cash. When you book your transportation thru us you guarantee a very good rate for your airport transfers in Cancun. You also receive a confirmation letter (e-mail) with your flight information along with precise instructions for your arrival and departure (depending if you purchase one-way or round-trip services). Our ground operators monitor all the flights and will be prepared to receive you even if an unexpected delay occurred. Take your time at Customs and don't worry: our drivers and representatives will be waiting for you outside the airport with a personalized banner with your name and a big welcome smile. To compare different transportation rates and make reservations on line please fill in the data box is on your left ( HOTEL TRANSPORTATION ), you will see a list of all transport services available for your destination. ( 5/ 5) RriGo0: Outstanding Experience...! Your flight is monitoring 24/7, No fees for flight change and delays, Professional bilingual Driver, the price is per vehicle NOT per person. 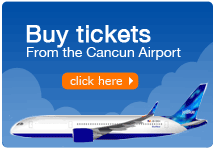 BOOK YOUR CANCUN AIRPORT TAXI TRANSPORTATION!